Stephen Lane, Prop Store CEO, commented on the upcoming auction – “The Alien creature from Aliens is one of cinema’s most well-recognised sci-fi creatures and we’re thrilled to be featuring this incredible costume in our upcoming auction alongside props and costumes from sci-fi films old and new, including Star Wars, Star Trek and The Martian. The auction will be live-streamed online for fans to track the bidding on auction day. A free preview exhibition will be open to the public in the run up to the auction showcasing over 300 lots from the upcoming auction. Movie fans and collectors alike will be able to see these incredible pieces of movie history up-close. The free exhibition is open to the public at the BFI IMAX, Waterloo, London, England SE1 8XR from 10:00 a.m. to 9:30 p.m., Sept. 7 – 26. 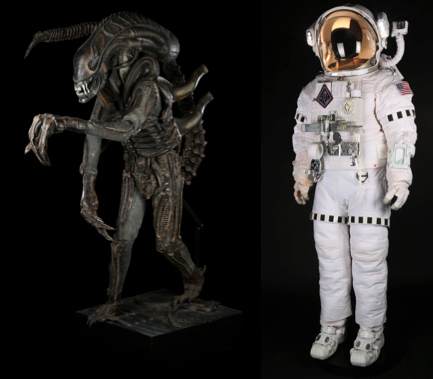 Prop Store’s Entertainment Memorabilia Live Auction, in partnership with the BFI IMAX proudly presented by ODEON, will also take place at the BFI IMAX Waterloo on Sept. 26 from 12:00pm.